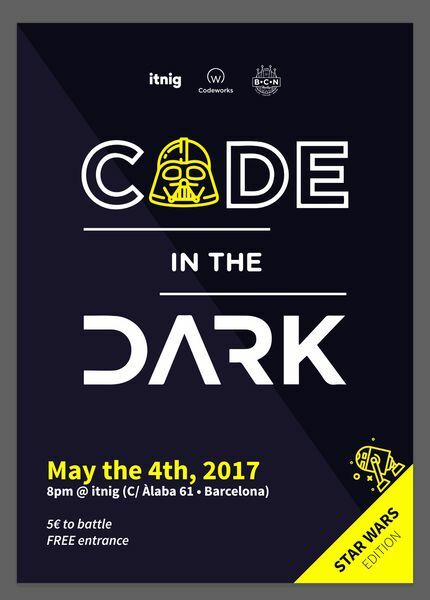 The 2nd edition of Code In The Dark Barcelona is in the pipeline, and as it landed on 4th of May, which is the official International Star Wars day, we decided to honour the force and make it into a Star Wars edition. But Code In The Dark is not just another Hackathon! It is an opportunity to put your front-end skills in the forefront of the event. Coders show off their coding skills and attendees get to be the jury. There's a bunch of nice prizes, this time there's also a 100 euro cash prize for the winner. But the ultimate prize is to be awarded the title of Barcelona's best front-ender! IMPORTANT: To sign up for the competition - CLICK HERE. • Each round lasts 15 minutes, and is between 5 to 10 developers. • No code completion tools, no compiling your code before 15 minutes. • All screens are mirrored so that the audience can watch and alert any rule-breaking. Companies: Send your devs and show off the talent you've got! Freelancers: There is no better way to find new clients! Students: Practice your skills and network for your next big job opportunity!